Amir Guberstein: Desolation Of Jerusalem 11, 2018, oil pastel and gesso with sand from the West Bank and Israel on paper, mounted on raw Indian linen, 42 x 36 inches. Courtesy of the artist. This piece will be featured in the upcoming launch of JVP’s online culture project GrayLit. AMIR GUBERSTEIN (b. 1985, Ra’anana, Israel) makes maps. He collects data like a cartographer, gathering information about bodies of water and land masses, as well as communities and their borders. Much of his information comes from independent monitoring agencies in Israel and the occupied Palestinian territories, which work to record the development of Israeli settlements. These resources chart the movements of power, and Guberstein understands mapmaking as a powerful political tool. Through a process he describes as intuitive and almost trancelike, Guberstein reinterprets this information to make new maps that are drained of their utility. Using Photoshop to combine charts and data points, he makes custom silkscreens that lock together like states or counties. He formerly used his screens in a conventional manner, rendering his images with traditional printmaking techniques, but in recent work he’s liberated his imagery from such material constraints, running a mixture of white and black gesso containing sand from his hometown and the West Bank through the screens onto a ground of white microsuede or paper. 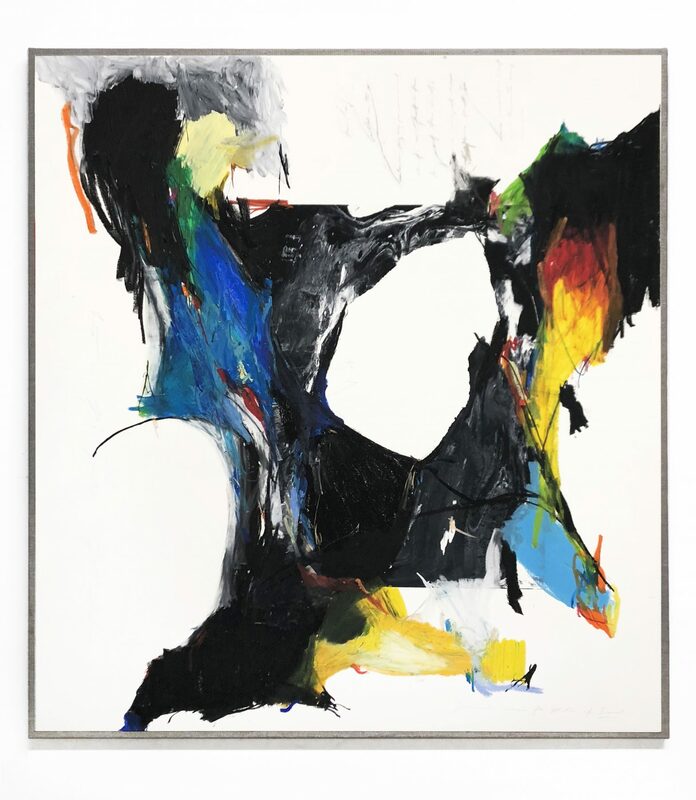 His marks recall De Kooning’s luscious brushstrokes, but if De Kooning’s marks suggest landscapes viewed from eye level, Guberstein’s vision is decidedly aerial. His works on microsuede are best understood as maps, but they carry a landscape’s insistence on subjective interpretation and personal vision. In February, a planned exhibition of Guberstein’s work at the Center for Jewish History was canceled as a result of a campaign accusing the organization of affiliation with the BDS movement. Guberstein began to rework these pieces in the wake of this event, building color and text into the negative spaces of the previously monochromatic work. Snatches of text from the Book of Lamentations, which mourns the destruction of Jerusalem and its desertion by God, underlie the paintings—sometimes peeking through in a single word or two, sometimes washed out, sometimes buried completely. AGRARCHIA, 2015, gesso on microsuede, 50 x 60 inches. Courtesy of the artist. THE-SIGH, 2015, gesso on microsuede, 50 x 60 inches. Courtesy of the artist. DESOLATION OF JERUSALEM 1, 2015-2018, oil pastel and gesso with sand from the West Bank and Israel on microsuede, mounted on raw canvas , 36 x 48 inches. Courtesy of the artist. DESOLATION OF JERUSALEM 8, 2015-2018, chalk, oil pastel, gesso with sand from the West Bank and Israel on microsuede, mounted on raw canvas, 36 x 46 inches. Courtesy of the artist. Untitled, 2015-2018, pastel and gesso with sand from the West Bank and Israel on microsuede, mounted on raw canvas, 24 x 18 inches. Courtesy of the artist. Amir Guberstein is a studio artist and a founding member of the curatorial team for JVP’s upcoming online culture project GrayLit. Guberstein’s work will be on view at the Untitled Art Fair in Miami with South of the Tracks Gallery (opening December 5th). His solo show at Fierman Gallery (NYC) will open in January. GrayLit: A JVP Culture Hub is a rich source of information and ideas outside the realm of mainstream media and dominant political discourse. GrayLit aims to contribute to an emergent culture shift happening at the intersections of Palestinian and Jewish histories via art and critical thought from and about interdependent movements for justice.